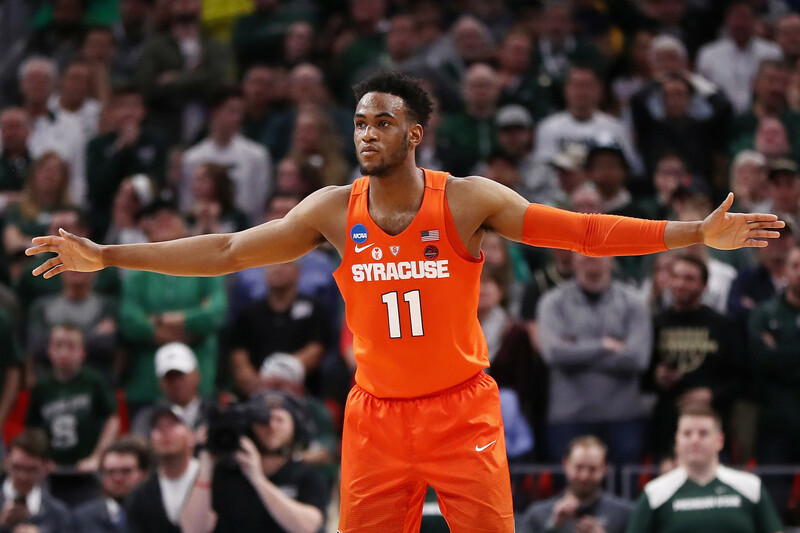 Now that Syracuse’s season is over and Tyus Battle declared for the NBA Draft, it’s time to take a look at what Syracuse will bring to the hardwood next season. Besides replacing Battle, Jim Boeheim is also tasked with naming a new point guard and center since Frank Howard and Paschal Chukwu are out of eligibility. Jalen Carey will likely be the front runner to take over the point guard position after being groomed this past season. While he had an up-and-down season, he may be primed for a breakout year without the added stress of being pulled after one mistake. With more guaranteed playing time, Carey’s feel more comfortable to play his dynamic style of basketball. The guard showed flashes of the player he could be, now the next step is to be that player consistently. Carey will have some competition for ball-handling duties though. Incoming freshmen Joe Girard and Brycen Goodine are both listed as shooting guards, but can play as points guards too. Both players are short for shooting guards, Girard is listed at 6-foot-1 while Goodine stands at 6-foot-4. Carey relies on his slashing ability, but Girard and Goodine both shoot the lights out of the ball. Central New Yorkers have become accustomed to watching Girard’s high school highlights where he pulls-up from 25 feet and nails a three in transition. In his senior season, he averaged 49 points per game. 49 points. Meanwhile Goodine put up some pretty gaudy numbers in Rhode Island. Granted he’s not pouring on almost 50 a game, but he did shoot 48 percent from three while averaging over 20 points. Goodine is a bouncy athlete that can throw down some nasty dunks over unsuspecting defenders. Next year the top of the 2-3 zone will have less length, but defenders like Carey and Goodine will make up for that with their athleticism. Earlier this year there may have been some debate about who will take over for Battle. That argument seems all but over after Buddy Boeheim became SU’s best shooter in conference play. In Syracuse’s last five games, Boeheim scored in double digits in four of them. He recorded a career high 20 points against Pittsburgh in the ACC tournament filling in for an injured Battle. If that game was any indication of what’s to come for Boeheim, Orange fans should ecstatic. To replace Chukwu, SU is adding center John Bol Ajak, a 6-foot-10 center born in South Sudan and raised in Kenya. He’s very raw since he only started playing basketball four years ago and this past year was an injury riddled season for Ajak. But the center has a smooth stroke, and is a solid three-point shooter. He also moves well for his size, which has been a problem for Chukwu and Bourama Sidibe. Ajak could develop into a very good big man for the Orange, as his development has quickly progressed. This season he transferred to Westtown School which produced stars like Duke’s Cam Reddish and Orlando Magic rookie Mo Bamba. If Sidibe can stay healthy, and if he’s fully recovered from his knee injuries, he may be in line to start next season. If not, Marek Dolezaj and Robert Braswell will rack up minutes at center. Both players need to beef up significantly, but similar to Ajak they move well and have a nice jump shot. In the past couple of years, Boeheim and his staff have moved towards finding big men who can stretch the floor. Chukwu was a large target of fans frustration that past couple of seasons, but he turned into a solid defensive presence to anchor the zone. He had a couple block parties this season, including one against Pittsburgh in the ACC tourney where he swatted six Panthers shots. For all his offensive flaws, Chukwu became a player that the Orange counted on. He’ll be tough to replace next season. Where did you get the idea you know anything about BB, much less SU Men’s BB? 1. If healthy, Howard Washington will be the starting PG. He was way more capable in his Freshman year than Carey. Carey tries to do too much and as we’ve seen will be eaten alive. HW is a true pass 1st PG, something we have lacked for quiet some time. Buddy is not ready or athletic enough at this juncture to be a full time starter. 3. Hughes will be the SG. 4. Bresett at SF and Marek at PF. Braswell is a small forward and if Jim has half a brain could be even better off the bench relieving these guys. He never played center, only the 3 or 4. 5. Sidibe will start at Center and from what I’ve heard, Akok will probably redshirt, no where near ready for the ACC, last thing we need is a copy of Chukwu, one of my favs and wish someone would’ve taught him something during the 3yrs, we had him. 6. Do some research before you write an article instead of lookingat a possible player roster….